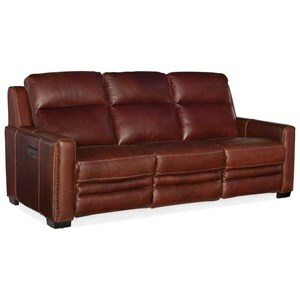 Stay true to your elegant and sophisticated style with this leather reclining sofa disguised as a stationary model. The wooden feet and traditional rolled arm and back design look just like an impeccably chic stationary sofa, but it turns into a recliner with the touch of a button. Both power and manual models feature release buttons built into the inside of the sofa arm, keeping your look chic and saving more space than a clunky handle mechanism. 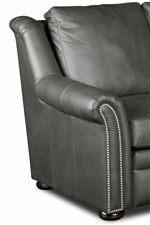 The Newman Transitional Power Reclining Sofa with Nailheads by Bradington Young at Belfort Furniture in the Washington DC, Northern Virginia, Maryland and Fairfax VA area. Product availability may vary. Contact us for the most current availability on this product. Tailoring Custom fitted covers are contour designed and tailored for maximum comfort. Seams are reinforced in stress areas and heavy-duty nylon thread is used in all sewing operations. Recliner Mechanism Each mechanism is cycle tested to ensure years of trouble-free comfort and easy, fluid operation. 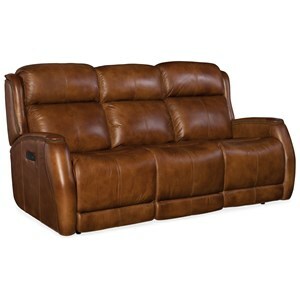 All reclining pieces, whether single or multiple seat, offer a deeply luxurious ride unparalleled within the industry. Padding & Ergonomics Cushions consist of a 4 ½ inch MARSHALL coil unit encased in premium foam. The cushion is then wrapped with a lowmelt fiber on top and bottom. The Spring Down cushion is then surrounded by a downproof ticking filled with a luxurious blend of down, feathers and fibers. 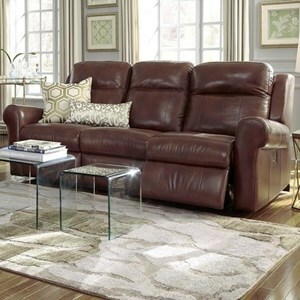 This cushion is designed to provide superior comfort combined with great resiliency. 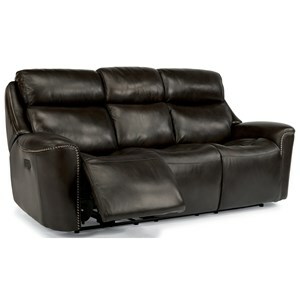 There are a lot of choices out there for reclining furniture, but with your taste for quality and craftsmanship in your furniture, there's no better choice than the Newman collection. 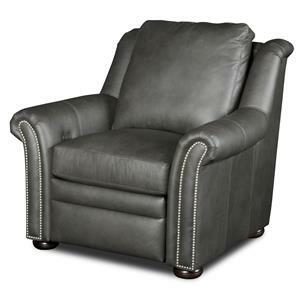 These recliners use the finest quality, top-grain leathers, incredibly supportive, inner-spring seat cushions, and were crafted by skilled professionals here in America. The Newman collection proves that reclining furniture doesn't have to be disposable, with this exclusive construction, your family can enjoy it and you can show it off for years to come. The Newman collection is a great option if you are looking for Traditional furniture in the Washington DC, Northern Virginia, Maryland and Fairfax VA area. Browse other items in the Newman collection from Belfort Furniture in the Washington DC, Northern Virginia, Maryland and Fairfax VA area.